With it’s simple design and iconic shape, it’s not only beautiful but it is super functional. This bag has been carried by countless celebrities over the years, including Audrey Hepburn who famously carried a Speedy 25 in 1965. I have always loved the look of a vintage monogram Speedy. The darker, more golden colour of the vachetta leather when it’s developed a patina over time is stunning to me. This is one of the reasons I chose to purchase my first ever Speedy pre-loved instead of brand new! I purchased my Speedy 30 from Malleries. Malleries is a popular pre-owned luxury goods website, made up of a collection of different sellers. While I have had nothing but good experiences using Malleries, it is worth mentioning that all sellers are different and if you are considering purchasing from them make sure you check their reviews. My Speedy 30 was made in France, in March 2000. So this little guy is 17 years old. Luckily the previous owner took great care of it and the patina is very even and a beautiful honey colour. It came with both the lock and the key, and there’s not a single mark inside. If you have your own Speedy and want to know how to read the date codes, Click here for the VintageHeirloom guide. In all honestly, I cannot think of any negatives for this handbag. I guess you could say that is personal preference though, so I will run through some pointers about the bag that may or may not work for you. The first thing I want to mention about the Speedy 30 is it’s size. This little thing can hold a lot! It is literally like a big hole and believe me it holds more than you think. It is worth mentioning however, that this is a small handle bag. So, it can only be carried either in the crook of your arm or by hand. This is something to consider if you’re someone who likes to cram your bag to the brim. Prepare for an achy arm if you take this bad boy shopping! You can now purchase a cross-body Speedy (Speedy bandouliere) which comes with a long strap for multiple carrying options but for me I didn’t like the look of it as much as the original. 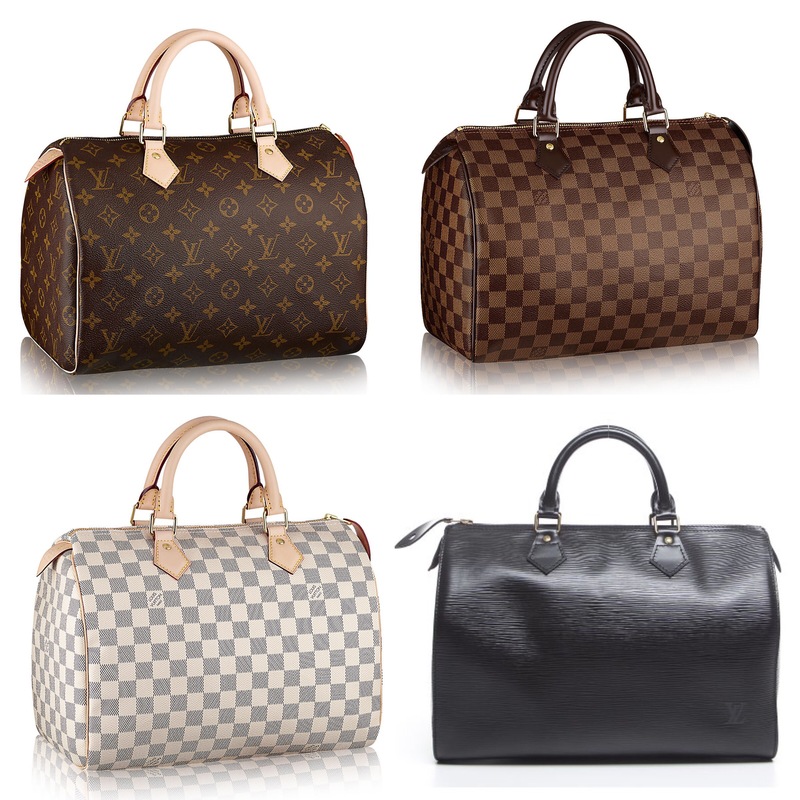 Louis Vuitton sell the Speedy in a selection of different prints. The classic monogram, Damier Azure, Damier Ebene and sometimes seasonal prints or Epi leather which now discontinued. Top left: Monogram, top right: Damier Ebene, bottom left: Damier Azure and bottom right Black Epi. As you can see, both the classic Monogram and the Damier Azure feature the vachetta leather which is basically just raw, untreated leather. Over time, as you use the bag the leather will change colour turning the lovely honey colour I mentioned earlier. I’ve noticed when discussing this in forums, that some people love this but others really don’t. I think it’s because you have to be extra careful not to mark it, scuff it or (God forbid) spill something on it. Once it’s stained it’s very hard to fix. This is another reason why opting for pre-loved is a good way to go, because once the leather has started to patina you don’t have to baby it as much (the more golden, the better!). I have had my Speedy 30 for 2 years now and it has been caught in the rain once or twice but luckily it hasn’t left any marks on the leather because it’s so old and the patina is so dark. Again this is just person opinion though. The Speedy 30 will always be one of my all time favourite. I am currently considering purchasing the Speedy 40 also because it will be great for travel. If you’re considering purchasing your very own Speedy, I say go for it. I’m certain you will not regret it. Follow Handbags&ZigZags on Instagram and stay tuned for the next review.